What comes to mind when you hear the words "birthday party"? I know I immediately think "cake and ice cream"....or more specifically, chocolate cake and ice cream (but that would be for my party). 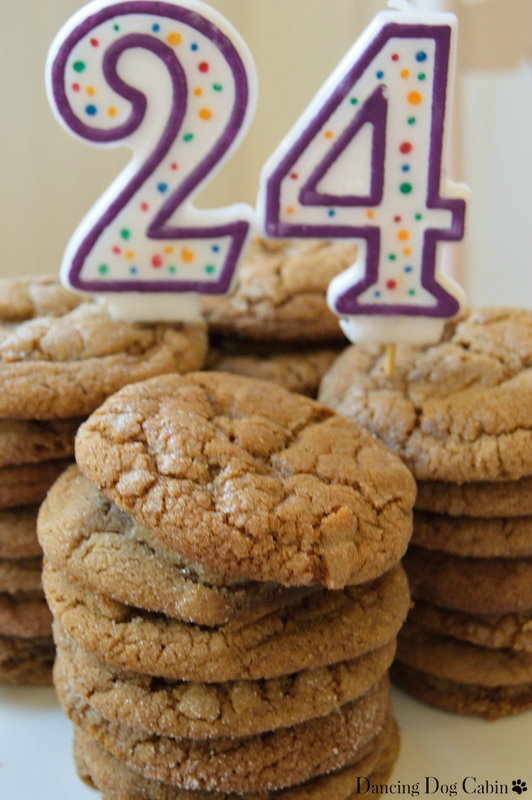 In this case, we were having a little celebration for my stepson's birthday, and instead of a birthday cake, he requested his favorite cookies....molasses crinkles. 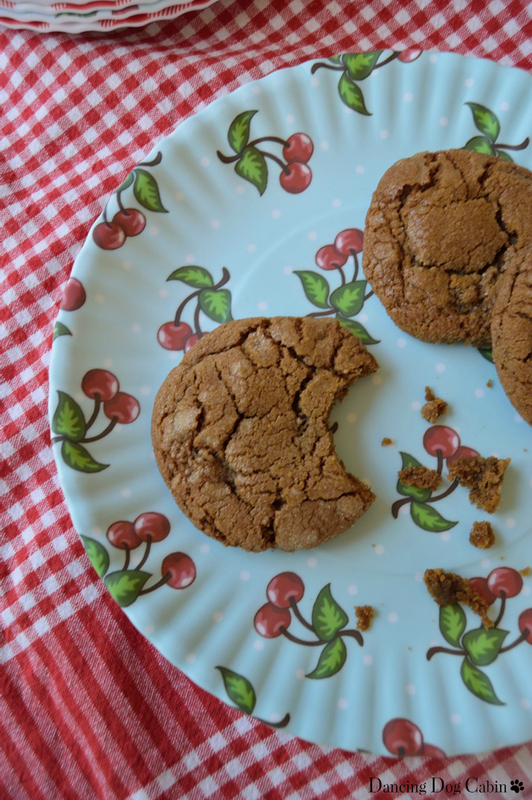 Molasses crinkles have been around forever. I think it was one of the first cookies that I attempted as a child when my mom insisted that I start baking from a recipe and stop wasting ingredients by randomly mixing together stuff from the kitchen cupboards; I believed that I had hoped that my science experiments would produce a yummy dessert (I never made anything yummy that way, just disgusting, gloppy messes that had to be thrown away). 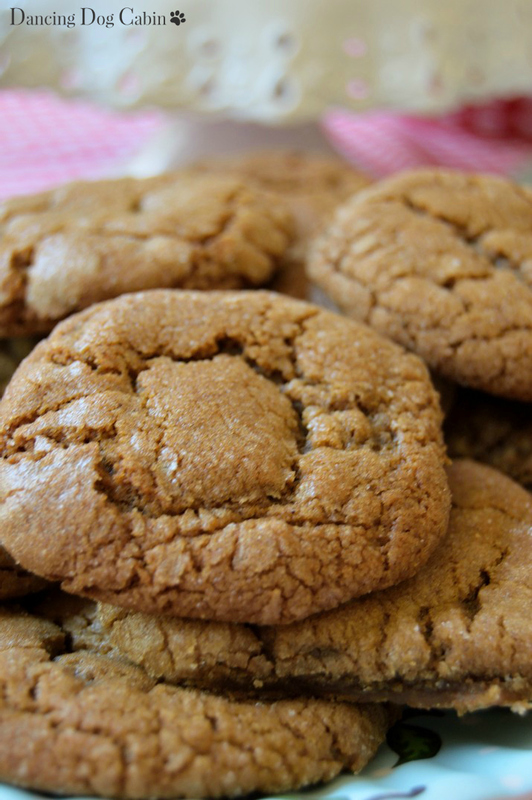 This molasses crinkle recipe (skip ahead to the end for that) yields my favorite kind of cookie....thick and chewy and buttery. 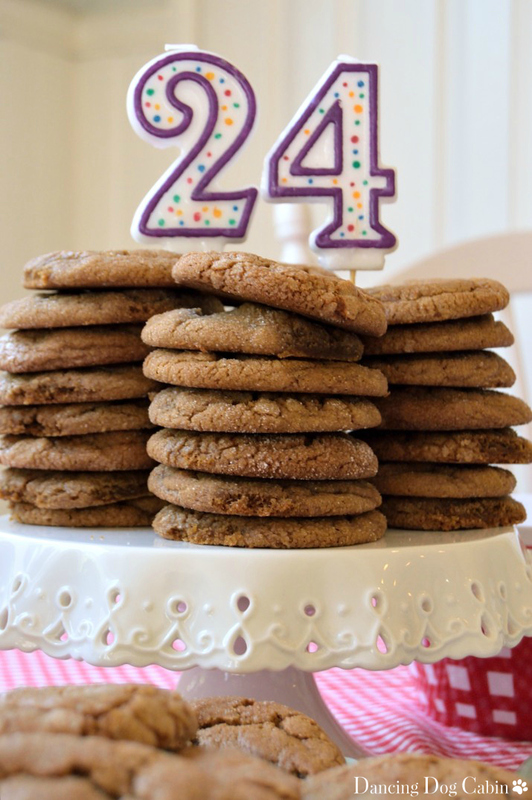 And yes, cookies can be the festive star of a birthday party table if you stack them up on a pretty pedestal or serving dish...and then add the birthday year in candles. These are the candles-as-numbers that you can get at any grocery store. Those little tabs on the bottom of the candle are useless when it comes to trying to stand them up in cakes or cupcakes (forget about cookies), so I stuck a toothpick into the bottoms, and it worked beautifully when it came time to sit each on top of my nice, neat cookie stacks. 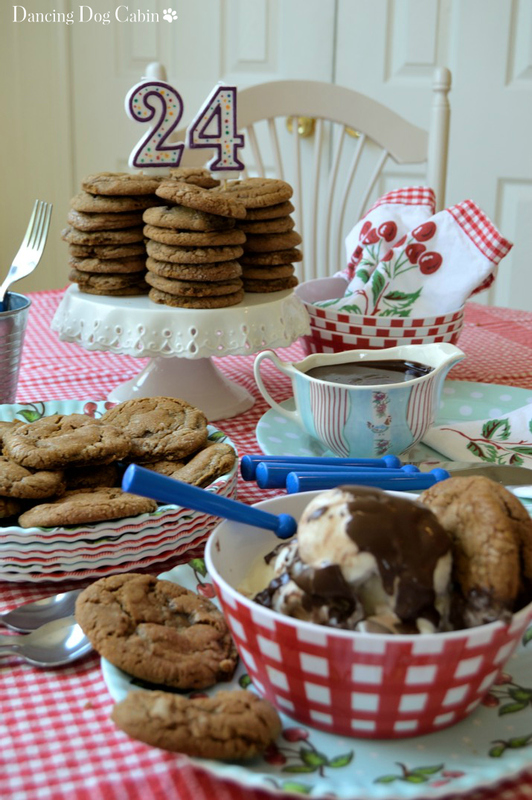 Introducing some good vanilla ice cream to the cookies elevates them to true birthday-celebration status. 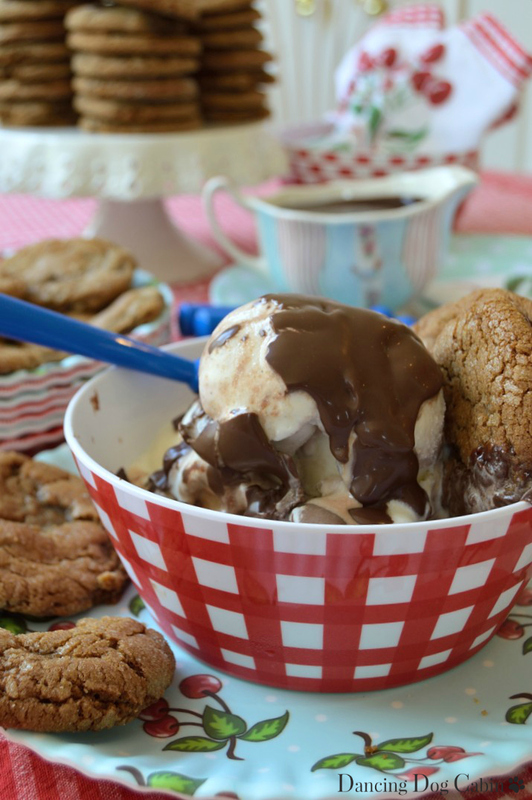 Is adding the chocolate ganache to this already wonderful cookie/ice cream duo just gilding the lily? Nope. Not in my house. 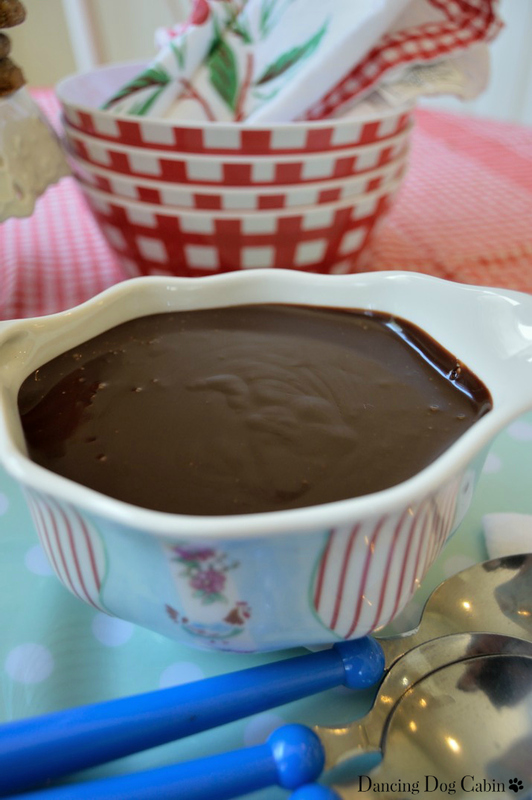 I added a splash of coffee liqueur to the ganache (click here for the recipe) to enhance and deepen the chocolate, and it tasted fabulous with the molasses and ginger of the cookies and the creamy vanilla ice cream. Cream together the butter and brown sugar. Add the egg and beat well. Add the molasses, and beat until light and fluffy. Sift together the flour, soda, salt, cloves, cinnamon, and ginger (another option is to use a whisk to mix dry ingredients and remove any lumps). Add dry ingredients to the butter-sugar-egg-molasses mixture, and mix just until combined (you don't want to see any traces of the flour mixture, but you don't want to over mix either). Chill the dough for at least 2 hours; overnight is better. Chilling the dough well helps to prevent the cookies from spreading in the oven and produces a thick, chewy cookie. Using a spoon or a tablespoon-sized ice cream scoop, form small-walnut sized balls. Roll each ball in granulated sugar and place on a non-stick cookie sheet (using parchment paper is even better, since it eliminates any sticking). Sprinkle each unbaked cookie with a few drops of water (this causes the cookies to crack when they bake) and bake for 10 to 12 minutes until the cookies are set, not hard (they will firm up as they cool). Allow the cookies to cool on the cookie sheet for 15 minutes before transferring to a cooling rack. Thank you so much for sharing this beautiful post and delicious recipe with Roses of Inspiration. Have a wonderful day! Hugs! Thank you Stephanie! 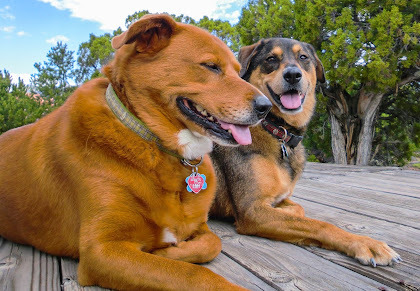 I hope you have a wonderful day and week! My husband would approve! Though he would probably want pie and ice-cream for his birthday. I guess that's the prerogative of the birthday boy or girl-- you get to choose your own birthday treat. Thanks for visiting! Lela, thank you and thanks for inviting me to your link party-- I'll be there on Thursday! Hi Melissa! 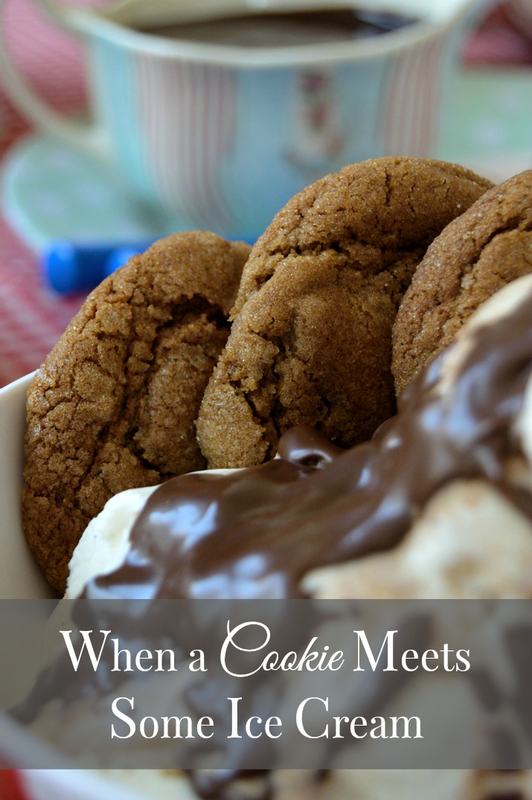 Thanks for stopping by Inspiration Thursday and linking up. I can't wait to try this recipe. I think I may have pinned it twice, just because it looks so delicious. Hope to see you next week! 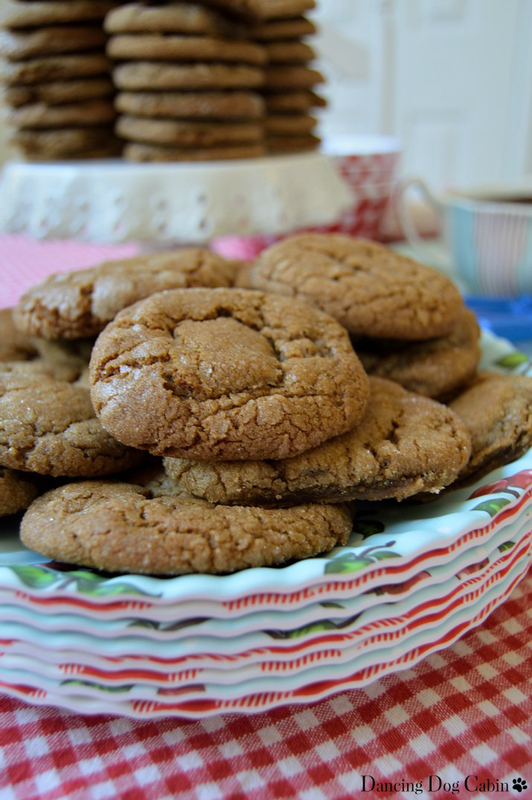 Molasses cookies to me always remind me of Christmas as that's when my family serves them.... But I think a birthday celebration is worthy of them too! 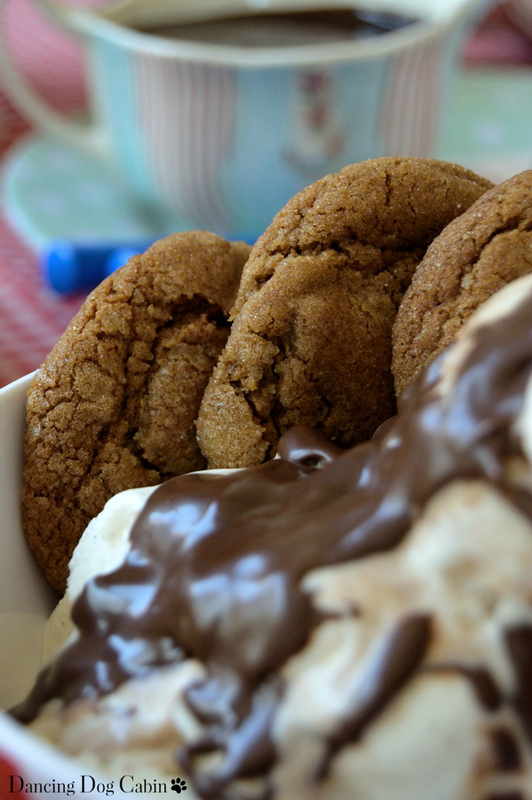 I think I would prefer cookies and ice cream to cake and ice cream, although I definitely wouldn't turn down the cake! Yes, these cookies are great for Christmas too. 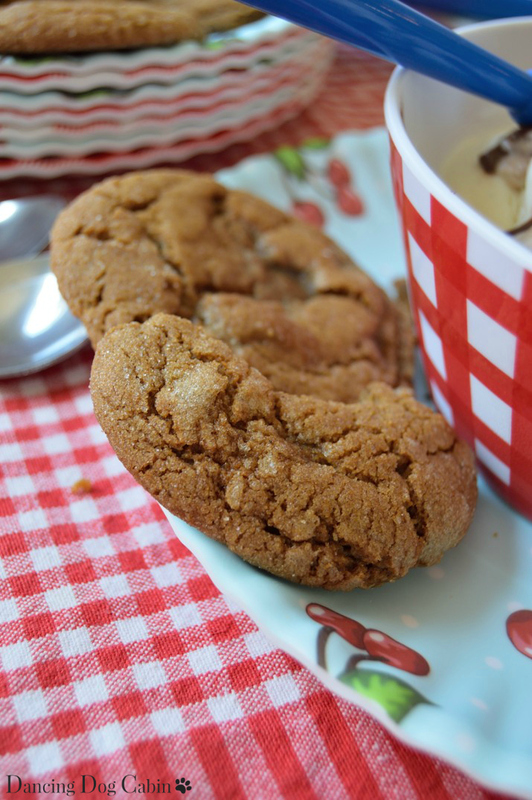 And I have made my favorite cookie recipes for my birthday several times-- it all depends on what I'm in the mood for. Thanks for visiting. Kimberly, thank you for your kind words! As soon as I'm done with the next post, I will definitely link it to Fabulous Party. Sarah, thank you and thanks for visiting! Melissa I am so excited to have this recipe! I picked up one of these at an event a week ago and hope to find buttery chewy softness, but no it was hard! UGH! Yours look delicious! We are much more cookie people than cake in our house. Now, let's talk dishes. . .I'm a cherry fanatic and you have me drooling girl! lol! Love, love your pretties and your photography is amazing! Thanks for sharing with SYC. Jann, I know exactly what you mean about hard cookies! I'm a dense, chewy cookie person too. I love these dishes too, and guess what? They are plastic! ( or more accurately, melamine, made to look like paper plates, ripply edge and all). I'm a huge fan of cute, plastic and melamine plates and trays for picnics, camping, taking goodies to the office, etc.since you don't have to worry about breaking anything. Thanks for visiting and thanks for your nice comment! This recipe looks great and I can't wait to try. The other thing I really liked were your red checked bowls and plates. Can you tell me what brand they both are and where you got them? Thanks! Sarah, the plates are actually melamine/plastic made to look like paper plates. I got the red checked plates in a shop in Julian, California and the cherry patterned plates from a shop called Mrs. Tiggy Winkles in old town Riverside, California (https://www.facebook.com/pages/Mrs-Tiggy-Winkles/628736680474468?sk=timeline). Unfortunately, she doesn't have a website or online retail, just a facebook page. The information on the bottom of the plates says onehundred80degrees.com. The red checked bowls are also plastic, I got them at Ralphs grocery store. All this is part of my 'plastic collection'-- which I like to use for entertaining outside, picnics, and so on. Thanks for visiting! They do sell some things online, so the plates may be available there. Hi there :) I found you via Cozy Little House. Those looks incredible! Yum those look fantastic! Thanks for joining Home Sweet Home! 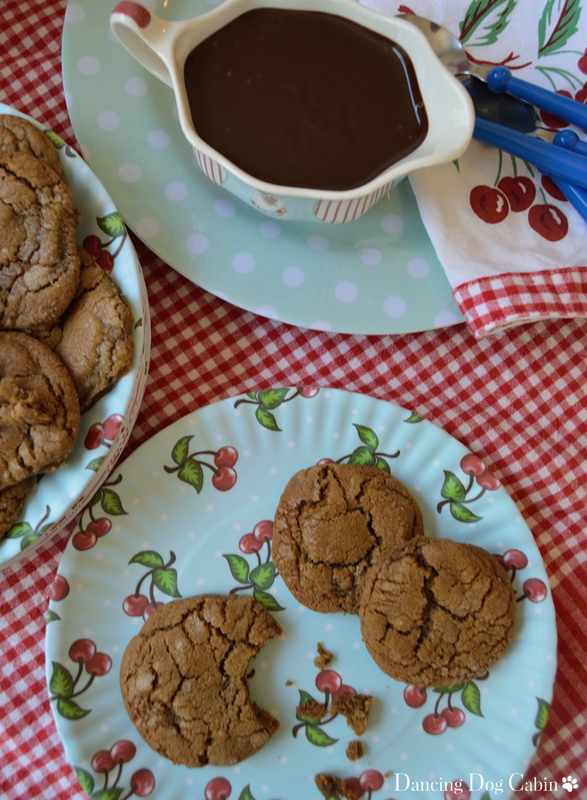 I have never had a molasses crinkle, but I can see this being right up my father-in-law's alley (mine too, but then again anything with sugar is up mine!) I am pinning to try! Thanks Jemma! It's great to meet someone who lives out west and loves this part of the country.